The phrase “At Your Service,” usually brings to mind the hospitality and entertainment industries. From a fine dining waiter, to the cast members at many popular theme parks, their entire existence is to meet and exceed the expectations of its patrons. We as a society look to these industries as a resource for escape and recreation with anticipation and high beliefs that our every need will be met. AHRA as a professional radiology management organization very much operates with this motto. This is evident with the recent 2017 Virtual Fall Conference hosted by the AHRA in October and November. In today’s world of reimbursement cuts, organizations and individuals need to find alternate ways to obtain continuing education, especially in the realm of management. The days of organization-funded travel and education trips are long gone, and professionals are looking for unconventional ways to meet their training needs and registry requirements. AHRA has come to the service of radiology professionals around the globe to offer just this type of opportunity. The Virtual Fall Conference provided radiology professionals and managers in every time zone an inexpensive and flexible way to obtain the vital training needed to stay abreast of the hottest topics in the industry. Attendees not only had the opportunity to hear live speakers over the span of two weeks, but they also had the chance to access recordings of these sessions for a full two months as time permitted in their schedule. No expensive plane tickets, hotel reservations, or rental cars were necessary, and attendees did not have to leave their jobs for several days to experience it. All that was needed was the desire to learn, a computer, and roughly ten hours of time. Access to a line-up of talented and energetic speakers who are thought leaders in their respective fields. The convenience of viewing the sessions anywhere, from a makeshift lunch break set up at your desk, to the comfort of your own home. The convenience of watching the sessions at any time throughout the busy work day. Robust Q&A sessions following the lectures. The virtual forum opens people up to ask more questions because the inhibitions of standing in front of a large crowd are taken out of the equation. Questions can be submitted directly to the speaker through the WebEx online platform. Affordable meeting registration rates without the expensive travel costs. Scholarships are available to several AHRA members who would not otherwise be able to attend the meeting. AHRA has taken the “At Your Service” adage to a new level by bringing their educational learning opportunities right to their members’ offices. 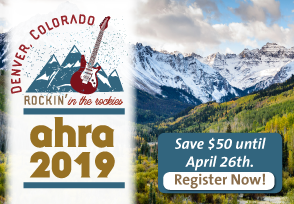 Next time you find yourself in a time crunch or without the necessary resources to fund a trip to a distant conference, consider taking part in one of the available AHRA Virtual Conference opportunities. You can even apply for a scholarship! I would like to thank AHRA for choosing me to be one of this year’s Ed Yoder Memorial Scholarship recipients and for giving me the opportunity to partake in an exemplary conference. Shelley R. Wells, BAS, BS, RT(R)(CT) is a system engineer at Technologix Group LLC. She can be reached at shelley.wells@gotechnologix.com. I’m constantly amazed at what the AHRA provides to us as members.